Toon's Tunes : What do squirrels eat, other than nuts and acorns? 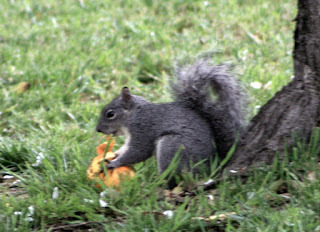 What do squirrels eat, other than nuts and acorns? He carried it from under the orange tree, across the lawn to shelter of the apple tree, sat there, peeled it, spat out the pith, and ate the juicy orange part. Just like we do.